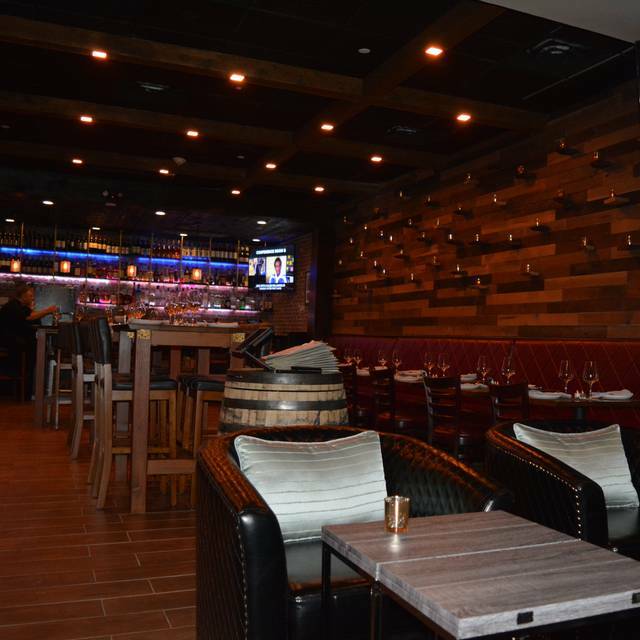 You must make reservations at least 5 minutes in advance of the time at Konoba Huntington. "Konoba" is the Croatian word for "Tavern." 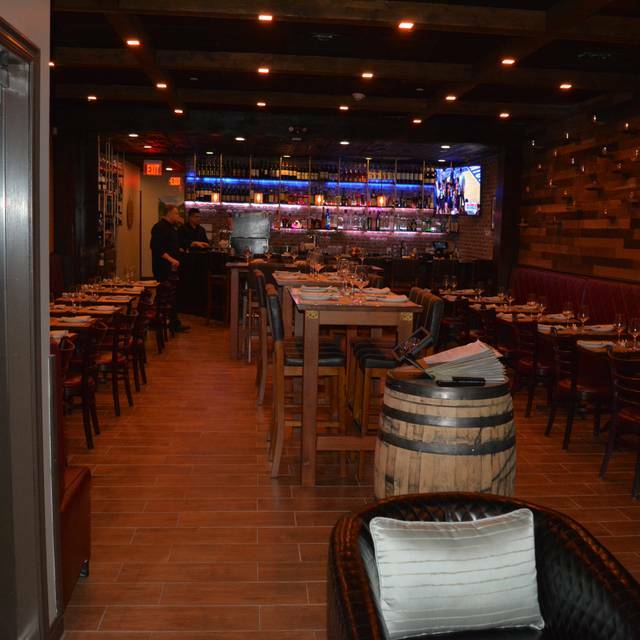 We are a Croatian inspired wine bar, lounge, and restaurant in the heart of Huntington Village. Building on nearly a decade of experience owning Huntington's Bin 56 Wine Bar, Chef and Proprietor Bruno Oliveira, along with Proprietor Daniel Pedisich have created an exciting Modern European menu of small plates and specialties in an elegantly designed space with bar, bench, high top, and lounge area seating. With Swallow now closed, we were looking for an alternative small plates menu in town and we were surprised to find this recently opened gem. Beautiful interior, food was great too (try that grilled octopus!). Had a nice bottle of the Croatian white. Will be back. We had dinner on Easter it was excellent. Deanna was our server and she was a pleasure. She kept checking on us without being pushy. The place was busy without being overly crowded. The rack of lamb was one of the best I ever had and my wife said her halibut was very good too. Will be back again soon. Food was delicious- generous portions. We did a lot of sharing since there were do many wonderful selections. Can’t wait to go back! Great meal, best I’ve had in Huntington in a long time. Octopus was very tender and seafood stew was cooked to perfection. Cool wine list too. Had a drink at the bar before we sat at a table and bartender was friendly too, table service was attentive. Will be back. We went to Konoba today for brunch, sat in one of the lounge chairs in the front while they had the windows open, nice way to enjoy the first warm day of the year and feel the breeze. We had the bottomless brunch drinks package and it was very worth it. Food and drinks both great, the lamb sliders are incredible and love how they feature beer from all the local breweries. Going back next weekend for sure. This was our first time to Konoba. We were a 2 couple table of friends. The restaurant is itself is on the small side with tight seating. Parking is challenging so give yourself extra time. We were seated on time, our server came to the table quickly and drinks were ordered. (Keep in mind though we had an early dinner reservation and as the restaurant filled up service became less efficient but still acceptable.) The menu offered a decent variety of some unusual dishes. We started with the shrimp & crab croquettes and the baby back ribs, both as appetizers for the table. Everyone thought they were excellent with the ribs beating the croquettes. 2 of us had the Brudet, which is a seafood stew (outstanding!). The others had the Ahi tuna bowl (delish! ), & the Frenched chicken breast, also good. As dinner progressed, the restaurant became tightly packed & even more energetic. On a positive, they did not rush us through our meal allowing us to enjoy everything. At the end we ordered coffee & dessert including the pretzel bread pudding & the almond cream cake. Both were good. Overall it was a very nice evening with highly rated food and drinks. We will be back! Would totally recommend going, but go early. Once it gets crowded, they rush you through your meal as they want the next group seated. The manager was hovering over our table once we ordered dessert to try to clear us out as quickly as possible (There were only two of us and we spent over $200!). Great food and interesting menu though---would definitely recommend to go at a slow time. Konoba was nice enough but wasn’t impressed. We were sat at what I guess you could call a very low unsteady table with sides that folded down. My husband is 6’3 so a table that low is not comfortable - when he placed his hands on the table it went lopsided & a wine glass fell & shattered. I asked to be seated elsewhere but was told the other tables were reserved (even though we had a reservation as well). We ordered plates to share & they had to be strategically placed in the center of the table because they would have slid off the sides - not what I want to worry about while trying to enjoy my meal. Food was good but nothing stood out. Overall experience was just ok. It’s s new place so I think everyone should form their own opinion, however my one suggestion is when you make a reservation request to be seated at a regular table or high top & NOT at the low tables by the window. Food was exceptional - the seating in the front is not very comfortable and the tables are not very functional. Everything seemed rushed. Continually asked to clear table before everyone was finished. Had dinner on a Monday night, our fourth time returning. Everything was excellent from the appetizers (we had a meat a cheese board, with some Croatian cheeses and meats), to dinner (T Bone lamb chops and Grilled Octoups) to the desserts (tres leches cake and nutella crepes). Hoping to make Konoba a weekly tradition! Food was unusual and tasty. Lots of choice. Pleasant atmosphere. Definitely worth a try. Service was very good-friendly and attentive. Great love the new restaurant in Huntington. Staff is so so nice and accommodating. Excellent first experience at Konoba! So pleasantly surprised by atmosphere, food and service. Our waiter was very good at suggesting different foods. It did become really busy and at times we were wondering where our waiter was but he wasn’t neglectful. Just super busy. 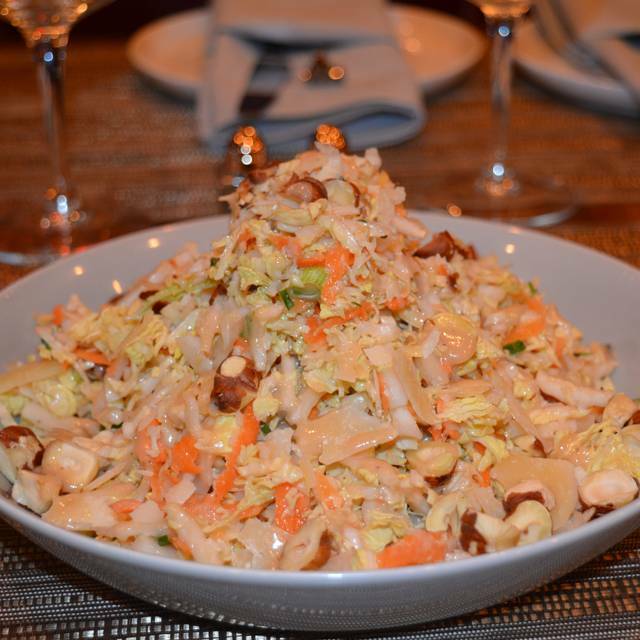 We had the cabbage salad and calamari to start. Both good. The showstopper was the grilled octopus recommended by waiter. It was so fantastic that I gave a taste to everyone at our table! 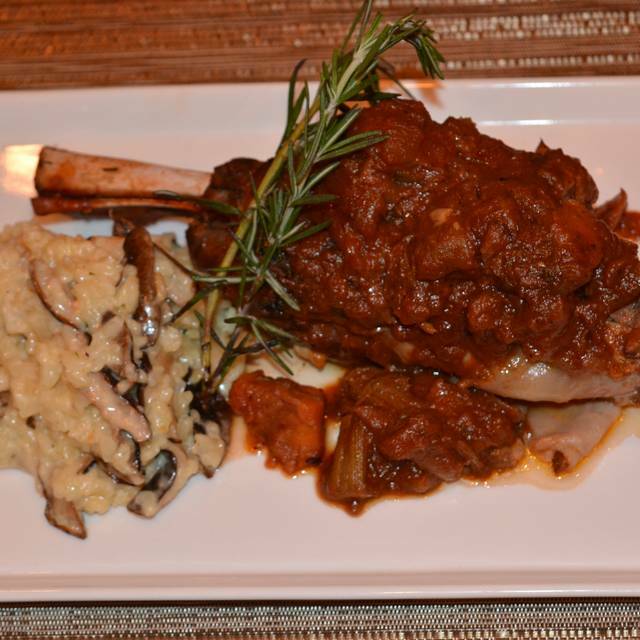 Hubby had the lamb shank with mushroom risotto and it was equally delicious. Wine selection great. Homemade bourbon vanilla ice cream not to be missed. This place is a little gem. We will be back! Thanks to Newsday, we tried this restaurant after it’s review. We went on a Saturday night with a reservation at 6:30. We walked in and it’s a small place, but nicely decorated. We had a drink at the bar and then we were seated at a small table right next to other small tables, it is very tight. The table next to us was so loud that I couldn’t hear my husband talk, I thank god they left pretty quick. I ordered a very expensive foie gras appetizer. I had three bites and the rest of it was full of filler of apples and onions. I was very disappointed with that. My dinner of grilled octopus was excellent and my husband’s fish stew was very good too. I won’t be rushing back, but I’m glad I tried it. We like to try new restaurants and wanted to try the Croatian food. Unfortunately, the service was really terrible and we weren't the only patrons aware of it. The food however was delicious, so I am willing to try it again if perhaps they were having an "off" night. Not one of our surrounding tables were happy and it was loudly discussed... no one's food went to the correct table even 1 time! Over 8 things ordered by us and they all got delivered to another table. The people sitting to our right and left were getting their food delivered to our table (very irritating) over and over again. By the 3rd time, I was ready to leave. Then the waiter didn't speak a lick of English, so when we told him it wasn't our food, he would rest it at the table anyway so we had to find someone else who worked there to take it away... not a relaxing experience. All of the meals ended up arriving at the same time when they finally did come. I don't want my apps served at the same time as my dinner. It felt very rushed and just more of a chaotic experience than anything- plates everywhere filling every inch of table space. You guys gotta get it together. Really great night with friends who were at Konoba this past Sunday watching a Croatian soccer match and wanted to check it out for dinner. Staff was professional and knowledgeable. The friendly owner kept checking on all the tables, and gave us a round of a Croatian after dinner drink which was very thoughtful. Have the lamb shank for sure. Going back again soon. I am Croatian. Wasn’t sure what to expect. Place is beautiful it was not very crowded which I appreciated as we were able to spend 3 hours and not feel rushed. Noise level was good. Our waiter, Giovanni was exceptional and charismatic. The owner was there and we were able to speak Croatian and he knew many people we knew. Food was good. We shared the calamari and then asked for the Fuzi to be done in a light marinara sauce which was great along with the shrimp. Our other dish was the octopus... delicious. Palachinka to share for dessert along with black decaf coffee. Coming again!!! So glad something different in Huntington! Creative cuisine and wine list. Brought a date on a weeknight, good crowd but it was still not overly loud and we were able to have a conversation. Looking forward to going back. AMAZING food, service and ambience. As a Croatian girl you can’t get better than this. We love it. It was nice to see the restaurant had every table full and the bar was packed. Owner greeted us and new which table he was going to seat us. Unfortunately the table was two small tables to be pushed together and the ladies eating at one of the tables were in no hurry to leave. Our reservation was at 8 we sat at 8:40. The owner made an effort to compensate for the late seating. We will absolutely return. Great Croatian - Meditareninan restaurant with a modern twist, fantastic selection of vine and outstanding service. It was a group of 8 of us and everyone ordered a different dish and loved it. Daniel is a great host and Di was very attentive and provided great service. Will be back for more. What a jewel in the hearth of Huntington! Waiting a long time to get a table. Then once we finally sat the they sat 3 people next to us at a table for two which was very uncomfortable. Tables are to small as I shared a salad with my wife and could barely fit it on the table. My wife sat on the bench which they apparently forgot to attach to the wall. So when anybody moved at either of the tables next to us the seat would move and shake her making hard to enjoy the meal. Food was good especially the lamb sliders. Not sure if I’m going back again though. Good food but still evolving. Will be interesting to see the menu grow. Service was super. Drinks yummy but way too expensive. Appetizer and shared plates were pretty good. Dinner was a disappointment. Food, service and setting were great. We enjoyed the food and had excellent service. Would definitely go back. Nice place to go with a group. We were looking for something different and stumbled across this place online. Food was excellent and our server was friendly; the owner came around and checked on every table. Interesting and eclectic selection of meats, cheeses, and an off the beaten path wine list. There was an energetic crowd at the bar. My wife said her grilled octopus was excellent, and my duck breast was cooked to perfection. Best of luck to Konoba, we'll be back again soon. Excellent dinner at Konoba! This is a great place to meet with a group of friends. They have high top tables in the middle of the the room that are great for socializing. 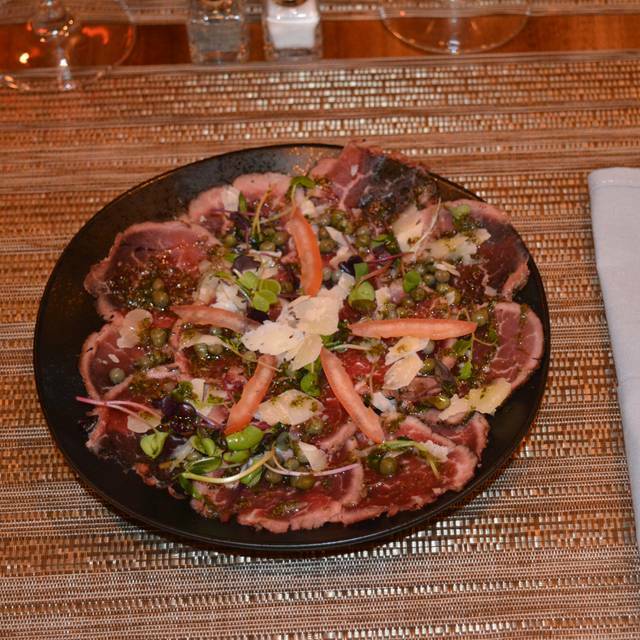 The menu is a mix of "small plates" and entrees, all good for sharing over a few glasses of the great wine selection. Lamb sliders and the tuna bowl were amazing. Great ambiance, great food, friendly atmosphere and staff, Huntington really needed a place like this. We recently had dinner at Konoba this past Saturday and were disappointed given previous reviews. The appetizers (calamari, truffle fries) were good but the entrees (Konoba burger, octopus) were not. The octopus was dry and overcooked and the burger was probably the worst I have had in decades (greasy, very under-cooked). The space is tight and the owner would walk up and down checking table availability on his I-pad while ignoring the customers. With so many good restaurants in Huntington this was a surprise to the downside. We had a reservation for a table, but we decided instead to sit at the bar. There was a guitar player in front, which made for a nice atmosphere. We ordered the fish tacos and the octopus. The tacos (3) were tasty. We would have preferred a softer shell - this was just too hard/crispy. The octopus was good, but the accompanying sauce wasn't very appealing - it was bubble gum pink and a bit too sweet. The staff/service was OK, but since we were at the bar, I can't review that. The biggest complaint was the noise level, which was awful thanks to a group of guests at the bar who were talking so loudly and laughing so hard that you could probably hear them across the street. This seems to be a problem at many local restaurants, where bar guests think it's OK to be as loud as they want, with no courtesy to the diners around them. This restaurant has the potential to provide a lovely experience, but in such a small space, it won't be possible unless management figures out how to manage the noise and overall ambiance. This is a new place in town at the location that used to be Hush. First what makes this a great place to try is that it brings additional diversity to the various ethnic offerings in Huntington, and should be embraced fully for that purpose. They have an interesting menu with a number of Croatian specialties that would be good for a full sit-down dinner or drinks/ wine tasting with tapas. Service was responsive, friendly and helpful with, among other things, pronunciations. All items tried appeared to be of quality materials, and well prepared. Seasonally offered "Irish Crostini" was fun and delish for those with a taste for a little twist on Corned Beef and Cabbage. Check the superb selection of Croatian wines. I think when we go back, we will try to do tastings and create a tapas experience from their appetizer listings. BTW, the space is lovely, comfortable and cozy. The food - yum! I wasn't sure what to expect from a Croatian restaurant, but loved everything we tried! We ended up getting 3 appetizers and sharing a main so we could try more things. Lobster and crab croquettes - delish! The table next to us was eating them when we got there so we got them too. They also got the PEI mussels which they said were fantastic. The fried burrata was unique and fantastic... it's like having a grownups version of a mozzarella stick, and their marinara sauce is hands down the best marinara I've ever had, and it's not an Italian restaurant! Then we had the truffle stuffed dates. I'm a huge fan of stuffed dates, but the touch of truffle with these sent them through the stratosphere... very tasty without being overpowering. Lastly we got the Argentinian pork baby back ribs. 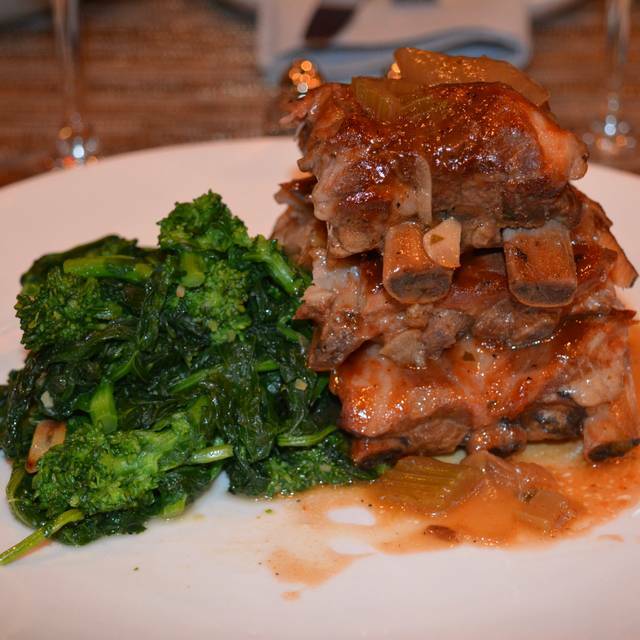 The meat was barely on the bone when the dish arrived, and was so tender, juicy and flavorful. The sauce had a bit more of a bite than the sticky sweet sauces some places use, very classy and delicious. I know i'm repeating myself, but everything about the food was great. Our appetizers arrived within minutes of ordering them which was a plus, but then dinner and the desert menus took a LONG time to arrive after. Maybe they were trying to be nice and let us enjoy the time on a Saturday night, but we did have to ask for our meal and the desert menu - it's almost like they forgot both. 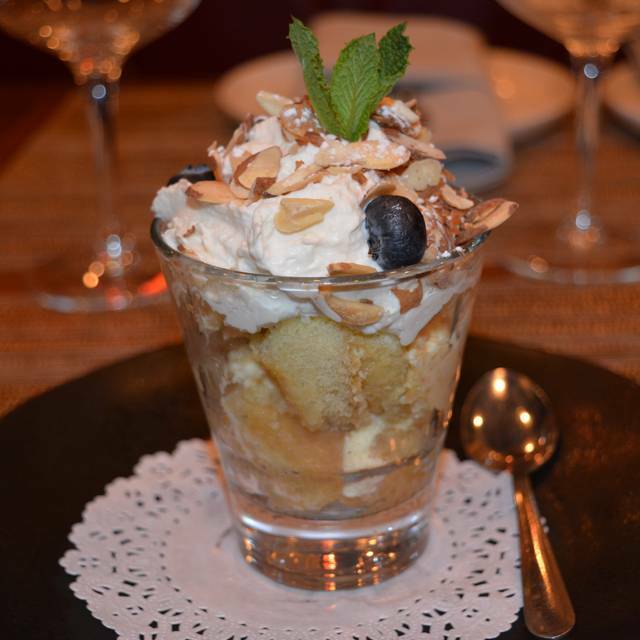 Anyway, we took desert to go, the almond cake. I didn't have any, but the Mr. said it was not what he expected, but it was fantastic. So, come to think of it, I think that summarizes our entire meal - not what we expected, but fantastic! Great place to get together with friends. Crew very friendly. Food choices just right. Not too much not to little. 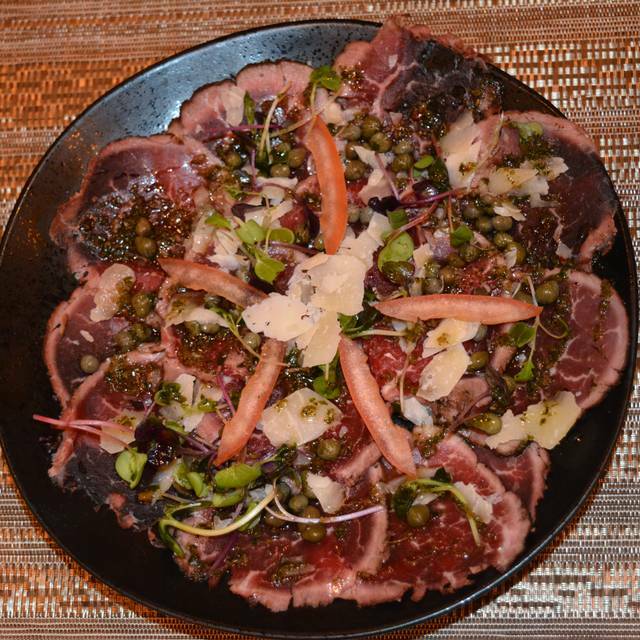 Great food to share with a wonderful wine list and impecable service. Went with a friend, we ordered the lamb sliders, grilled octopus, and duck breast. All were top notch. I've never had such a tender grilled octopus; when a restaurant does this dish right, you know they are doing the right thing all around. We topped it off with a bottle of Posip white wine from Croatia which was wonderful. Space is beautiful and inviting. See you again soon Konoba! We went to Konoba for the second time, and it was great. 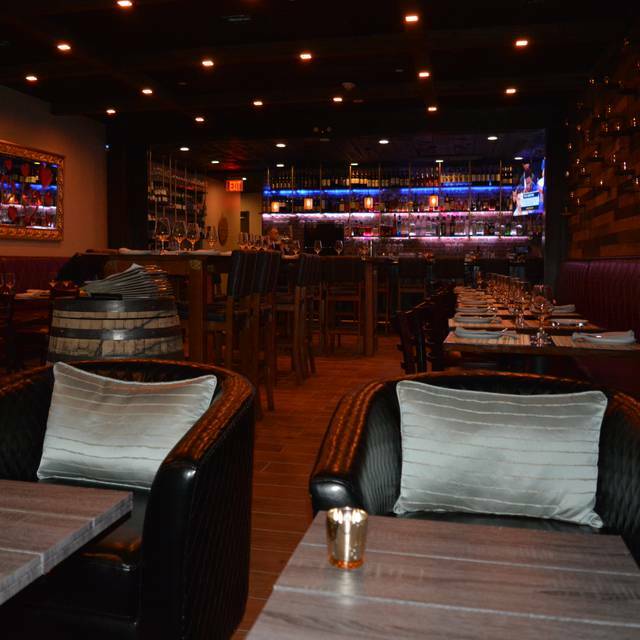 Food is top notch and creative, wine list is far from ordinary, and the drinks are strong. They're doing brunch now on the weekends, so we'll try that soon. Two thumbs up, we'll be back. Service was very slow. Food was not great. We had several dishes and we not blown away. HAD TO WAIT A FEW MINUTES BUT IT WAS WORTH IT. FOOD WAS REALLY DIFFERENT AND DELICIOUS.